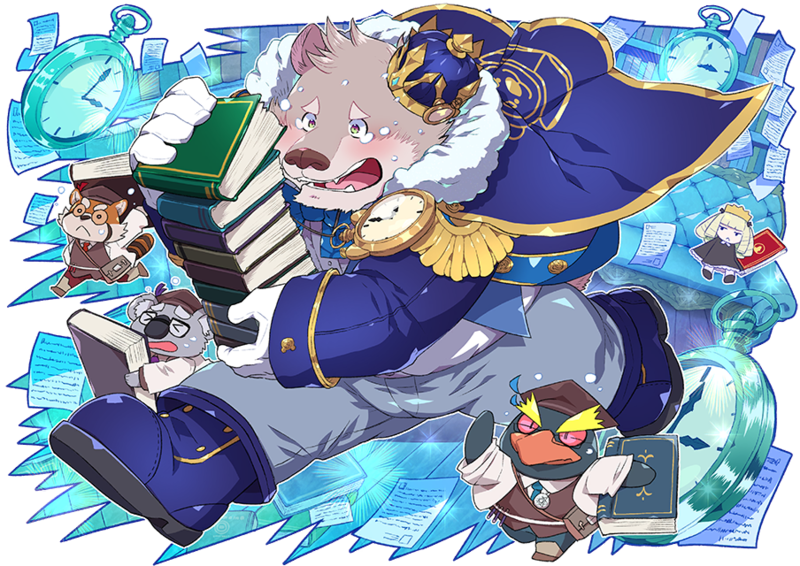 "A bear Transient and high school student who is highly intelligent and knowledgeable in many subjects. He skipped a few grades to enter a university medical research lab. His personality, however, tends toward cowardice and nerves. The people around him take advantage of those attributes and force their troubles onto him. He currently lives in an apartment complex that once allowed pets and has now become a dorm for Ueno-based Therian Transients in Taito Ward. He looks up to the polar bear Transient who is the housemaster there and also his elder in med school... Actually, it would be more accurate to say he's completely dependent. Also, he's a crybaby." A bear beastman and high school student. Jambavan is an incredibly gifted student with a brilliant mind and a broad array of knowledge in various subjects. As an honor student, he's been given clearance to study medicine at university well above his grade level. Despite his genius however, Jambavan has a fundamentally timid, submissive nature and is a chronic worrier, which can be troublesome for the older students he is surrounded by. Currently, he lives in a Pets-OK student dorm specifically for beastmen. 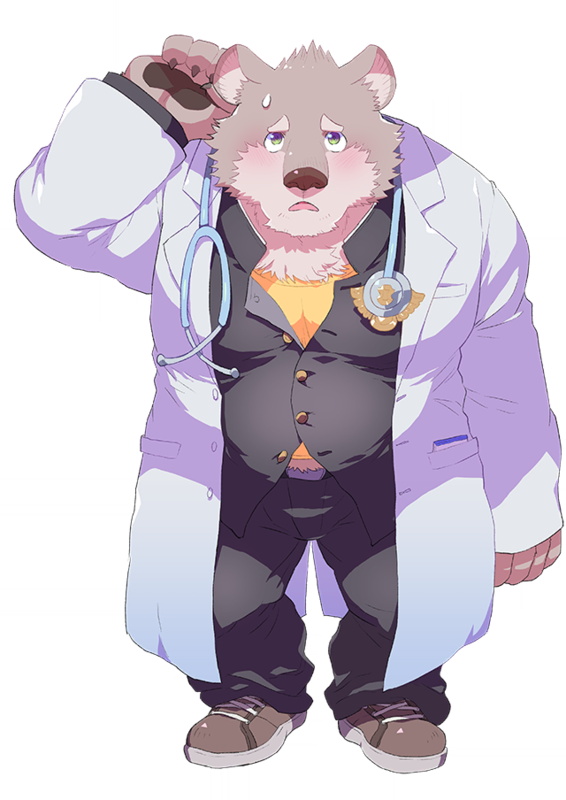 His dorm manager and medical senpai, a polar bear, dotes on him like a younger brother and receives Jambavan's utmost devotion in turn. Cries often. Jambavan. It's nice to meet you. Alice ordered me to- ah!... F-forget I said anything. Prosperity to the righteous, and downfall to the evil. O, maiden of the jewel...Jambavati. "The Jewel he wields is a Sacred Artifact especially effective against powerful evils that would destroy the world. However, against any other enemies, its Rule bestows only blessings. World-destroying evils aren't all that common, though. The price of using the Rule forbids him from unleashing his full strength on those weaker than him, often rendering him powerless. For certain reasons, he's often in the company of a little girl but is unable to mentally or physically go against her wishes, resulting in his being used like a slave." Normally he's very busy between his part time work and getting called in to help as a research assistant. He goes to bed with a fervent wish to at least read at his leasure inside his dreams. But for someone who's always being badgered by something no matter what time it is, a peaceful area does not exist. Even in his dreams he holds his pocket watch and frets over the time, hounded by documents he needs to deal with so that even in his long-awaited kingdom of books he has no time to read. His emotions on the verge of bursting out would be expressed in a way he never thought up of in the world of dreams. On one hand he respects his research senpai. On the other hand he sees him as a prat who passes off work. His Role is "being unable to go against those who aim to maintain the world." On the flip side, this would mean that he's a fearsome opponent who would block the way against anyone who would destroy the framework that is Tokyo. *cough* I am the Study King, Jambavan! ...But, now isn't the time for introductions, I have to hurry, hurry! Y-yeah... If we're together... then I can do it! Please leave it to meeee! Garbage belongs in the trash can! The workload just keeps piling up!! I work and work but there's no end in sight...! Somebody help me! Please! I can't keep up with all of this alone!! Aah, I can take a break at last... It's all thanks to you. Say, would you like a cup of tea? Ueno Fluffy Dream Kingdom (4/17/19 ~ ?? ): "Tokyo Afterschool Summoners." Aaaaaah! Is it that time already!? I need to hurry, I need to huuuurry!! Inspired by the bear king Jambavan, a figure in Indian poetry. The Japanese wording of his Charge Skill in the game implies he gives Blessing to all enemies within 2 squares, but actually, he just gives Blessing to all allies 2 squares around him, and only enemies hit and damaged by his Charge Skill get Blessing applied. wait, He doesn't like Leib?? I thought he respected him! >>2232 Me again, same person. I WAS WRONG, HIS VOICE IS BEAUTIFUL. i guess i don't like it too much because it gets far too low sometimes. 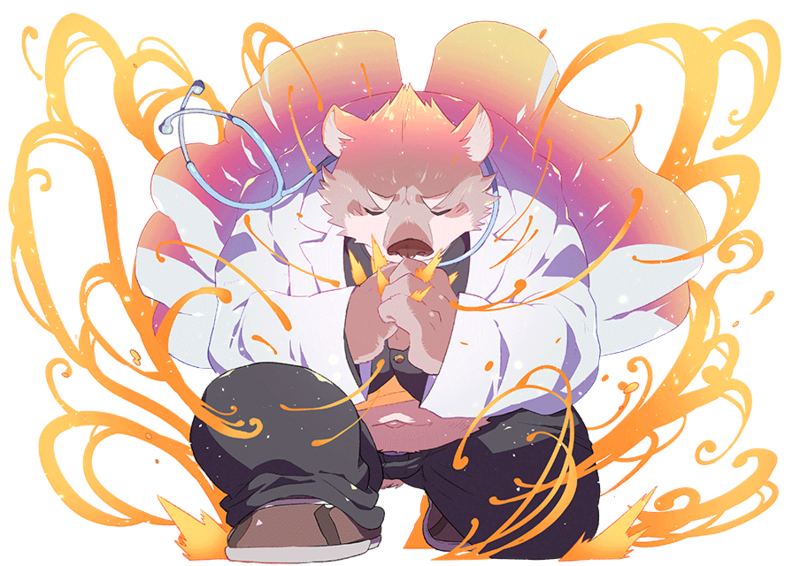 He looks like a very cute character and would look like a good character to use, but HIS VOICE. It ain't bad, i guess it just doesn't fit at times. >>10 I thought he was a Koala? but I guess it's hard to tell since we can't see if he has an extra thumb or not. Jambavan is speculated to be a Grolar Bear, the handsome creation between a polar bear and a grizzly bear. This page was last edited on 19 April 2019, at 14:54.